The United States is seriously under-insured. Forty percent of the populace has no life insurance, and among those who have it, one out of five say they don't have enough. The gap persists partly because fully underwritten life insurance is difficult to purchase. It typically requires a mini physical that includes the drawing of fluids (e.g., blood and urine). Underwriters, for their part, often avoid applicants with serious diseases like cancer because those cases require an arduous -- and expensive -- medical assessment process. AI and machine learning can have an "exponential impact" on the life insurance industry, says Atidot CEO Dror Katzav. In the past, carriers may have utilized a handful of predictor variables to identify insurance prospects, e.g., age, gender, smoking, etc. His firm uses 500-600 variables. One variable, for example, indicates whether your household income is more or less than your neighborhood's median household income. This could be associated with a propensity to buy life insurance. In making predictions, Atidot employs sophisticated ML algorithms like Deep Neural Networks (DNN) and Random Forests, but it avoids overly techy language when interacting with insurance executives or regulators. Discussions are focused on premium levels and missing payments -- not output neurons or sigmoid functions. "Black box" type ML methods often don't work well in a the insurance business context, adds John Lucker, Principal - Deloitte Advisory, Deloitte & Touche LLP. They are often not understood by C-suite executives, and they are the ones that have to support a new project. For that reason, many insurers still favor more interpretable algorithms like logistic regression. "Everyone wants to know why an underwriting decision was made," explains Laura Boylan, Haven Life's Product Owner for Algorithmic Underwriting, so model interpretability matters. To the extent that AI, or machine learning, can simplify the underwriting process -- make it less intrusive, faster -- more people may be encouraged to apply for coverage, says Boylan. In the case of the chronically ill -- people with diabetes or depression, say -- Haven Life uses machine learning algorithms like Random Forests to cross-check public records (e.g., motor vehicle records) to verify the information that applicants have entered on the company's website. The system may prompt additional questions, like details of an applicant's prescription history. The algorithms don't reject applicants, however, they simply raise a red flag--at which point human underwriters are summoned. The entire life insurance industry recognizes that machine learning is important, and will play a critical role in the industry's future, Boylan says, but it remains difficult to integrate these new processes into legacy infrastructure systems. Many life underwriters are working with systems infrastructure that is very old--going back to the 1970s in some cases. Katzav expects insurance companies implementing AI to begin with the "easy pieces," like enhancing the customer experience, which can have an almost immediate financial return, and eventually apply AI into risk management, and product development. "Fraud prevention is huge," adds Boylan. Machine learning is already used by 22% of life carriers to identify potential fraud, according to RGA's 2017 Global Claims Fraud Survey. It is most common in the Asia Pacific region where its use has reduced end-to-end time for cases involving fraud by 15 days, or about 20 percent. With AI, you are changing the paradigm, says Katzav. "You can interact with the customer in real time. You can analyze risk in real time, when the interest rates are changing, for instance, not months afterward. It creates a better customer experience." Andrew W. Singer, principal, Singer Publications, been a professional business writer and editor for more than 30 years, including two decades as editor-in-chief of a financial services magazine. He received an M.A. in statistics from Columbia University in 2017 and has been an associate instructor in Machine Learning within Columbia's M.S. Program in Applied Analytics. Micro-insurance hasn't worked; Can blockchain fix it? Micro-insurance (i.e., small-premium insurance for low-income people) hasn't really caught on in the developing world. But two new initiatives will soon be offering micro-insurance (MI) with a twist: MI with blockchain and smart contracts Both involve crop insurance. When an extreme weather event strikes -- drought or a typhoon, say -- the small maize farmer in Kenya or the rice paddy farmer in Sri Lanka do not even need to submit a claim. Nor does the insurer send a claims adjuster. A claims payment is triggered automatically by a blockchain-enabled smart contract. Micro-insurance programs typically struggle to enroll farmers. Take-up rates in India, where the government subsidizes crop insurance, are estimated at less than 5% of eligible small farmers. One reason is distrust of the process. Small farmers don’t believe they’ll really be paid when the monsoon destroys their crop -- or if they are paid, the benefits will reach them too late. A partnership among Aon plc, an insurance provider; Oxfam, a charitable organization; and Etherisc, an InsureTech firm; is working to bring crop insurance to 3,000 small, rice-paddy farmers in Sri Lanka. The pilot program uses a weather data index as a trigger for smart contracts that are built atop an Ethereum public blockchain. If wind speeds in a certain locale ever reach 75 miles per hour during the growing season, for example -- typhoon force winds -- a payment is triggered automatically. Eventually, the program may be extended to 800,000 Sri Lankan farmers. These type of coverages are called parametric insurance because they do not indemnify the pure loss, but agree to make a payment if a pre-defined event parameter is met or exceeded. This event could be a natural disaster like an earthquake, tropical cyclone, or flood where the parameter or index is the magnitude, wind speed or precipitation, respectively, but it could also be something more mundane like an airline flight delay, where a flight delay insurance payout could be triggered by a delay of more than two hours. The beauty of parametric coverages are that there are no disputes, notes Etherisc CEO Stephan Karpischek. It is easy enough to verify wind speeds by an agreed-upon “oracle,”or source of truth, like a local weather station report. No claims adjusters or insurance underwriters are required. Software, not human beings, triggers the claims payout. Delay in claims payouts is an impediment to the "take up" of crop insurance in the developing world. In India, "delays in claims settlement, have led to 95 million farmer households not being covered, despite significant government subsidy," according to one report. Another notes that large numbers of Indian farmers "did not receive any claim amount even when they faced crop loss." It can take traditional insurance companies as long as one year to settle some crop insurance claims, says Christopher Sheehan, CEO of WorldCover, another firm that is building a blockchain-enabled crop insurance product. The insurer has to send someone to assess the claim, there’s an audit, the insurance company may submit a claim to a reinsurance company, money may have to be sent across borders, and so on. WorldCover is targeting small farmers in Africa where drought is a persistent worry. A maize farmer in Ghana, for example, might become eligible for a claim if less than 200 millimeters of rainfall is observed during the growing season. Once the rainfall is measured, a claim payment would be instantly sent via a mobile money service like M-PESA. Finding trustworthy “oracles”for parametric insurance cases is a challenge, says Sheehan. The National Weather Service might be a a good “source of truth”when confirming a hurricane event in the U.S., but determining drought conditions in Ghana could be more problematic. Can you really trust the local weather station using rain gauges as an “oracle“? Or do you go instead with a meteorological and environment-monitoring satellite service that measures soil moisture from outer space -- but which may be more expensive? Historically, it has not made sense for a commercial insurance company to write a crop insurance policy for just a few dollars (premium) a year, notes Karpischek. It’s just not worth the insurer’s time and expense. Parameterizing crop insurance policies could drastically reduce business complexity, though, and with blockchain-based smart contracts insurers would need fewer local agents, with “oracles”replacing adjusters on the ground. Parametric coverages are still relatively rare in the insurance world, but their number is growing. "I'm very keen on parametric insurance," says John Lucker, Principal at Deloitte Advisory, Deloitte & Touche LLP. It allows for better frequency-severity modeling. It’s analogous to a casino's vigorish, or “vig.” First the break-even odds are computed, then several basis points are added for the house, the "vig." This becomes the casino's--or insurance underwriter’s--profit margin. "It takes out a lot of the uncertainty" that is typically associated with insurance, says Lucker. Traditional insurance suffers from an inherent conflict of interest, adds Karpischek. The same entity that manages the claims payout -- i.e., the insurance company -- stands to profit by denying (or delaying) payouts. This, arguably, goes to the root of farmers’ distrust of insurance. If, however, you were to have software in the form of smart contracts take over this critical process, the trust deficit in the developing world might fall. Andrew W. Singer is a freelance data journalist based in New York City who writes about blockchain technology and machine learning. He is the founder and former editor-in-chief of Ethikos: The Journal of Practical Business Ethics. This article appeared orginally in Financial IT on January 8, 2019. If Market-Linked CDs Fall, Will ‘Structured Notes’ Rise? Key Investment Services (KIS), the retail broker/dealer arm of Key Bank (Cleveland), for instance, introduced MLCDs about two years ago, but began offering structured notes two months ago, according to KIS President Marc Vosen. Not that long ago, market-linked CDs (MLCDs) were the ‘next new thing’ in bank investment programs. Each quarter the MLCD share of program revenues seemed to rise, accounting for 5.1% of the bank brokerage revenue pie as recently as the 4th quarter of 2011, according to BISRA. According to Vosen, when interest rates plummeted—and then stayed low—bank customers began to clamor for more yield and shorter maturities, which they couldn’t get with MLCDs. So KIS began to look at structured notes—albeit in a deliberate, cautious manner. Recognizing that education is critical, KIS developed three levels of training for advisors who would be selling the notes, including a FINRA training course, in-house training, and outside wholesaler training. The bank began with a single ‘notes’ vendor, although a second and third are coming on soon. Their notes have principal protection, but Key will consider selling non-principal-protected notes, sometimes called buffered notes, in the future, says Vosen. He recognizes that means introducing yet another suitability standard; they (buffered notes) are more appropriate for clients with a greater risk tolerance. With regard to structured products generally, “The future is in non-principal protected [structured] products,” says Craig Brede, vice president, private investors product group, Goldman Sachs, speaking at BISA’s March conference in Hollywood, Fla. “It's where the wrapper is most efficient.” The FDIC protection that comes with MLCDs is relatively expensive. According to a January 2013 survey, commissioned by Incapital LLC, and conducted by BISRA, only 16% of banks and credit unions surveyed sold non-principal protected structured notes in 2012, and only 14% expect to add them in 2013 (a total of 30%). By comparison, 65% sold income MLCDs, and another 18% are expected to add them in 2013â€”for a total of 83% of banks surveyed. One will probably see a continued decline in MLCDs in the future, agreed panelists at the BISA session, “Implementing and Supporting a Structured Investments Program.” There are simply more upside options with structured notes: a shorter maturity, or a higher cap, or a higher minimum guarantee than with a MLCD. Still, “Be careful,” says Larry Wilson, executive director, JPMorgan Securities, another panelist at the March convention. “Don't get into problems that will set the whole program back.” Structured notes are probably more suitable for larger banks—or at least those with more resources—because they require considerable education, and education is expensive, he suggests. Which of these three structured-product alternatives will prevail in the bank market? Vosen’s guess is the MLCD will be the biggest seller in the channel when interest rates return to normal and the spreads between FDIC and non-FDIC insured products narrow. That said, he expects “great interest” in buffered notes (non-principal protected notes), though probably among a less risk-averse, more sophisticated bank investor. It’s the mid-level-risk structured product, or principal-protected ‘notes,’ that “will get squeezed” when interest rates rise, in his view. Life insurance is an inherently tough product to sell. People just don’t like to think about dying. Insurers have been trying for years to reduce the time required to underwrite life insurance, and that’s why predictive analytics (PA) is so tantalizing. It promises to cut the time required to approve permanent insurance policies from months and weeks to days by replacing the cumbersome, time-consuming paramedical examination—(which typically involves drawing blood, urine, etc. )—with less invasive and faster predictors of a long and healthy life, like electronic drug prescription histories, MIB (Medical Information Board) dataâ€”and even driving records, including auto accident histories. More critically, there are regulatory/legislative concerns that could have a “chilling effect” on industry innovation. On December 18, 2012, the Federal Trade Commission issued orders requiring nine data brokerage companies to provide the agency with information about how they collect and use data about consumers. “This bodes ominously for using this information for life insurance,” Lucker tells BISM. Most data sources used in PA are not proprietary. They are publicly available information sources—like motor vehicle records. This means life insurers don’t control the data, and they can’t readily account for disparate outcomes, Lucker tells us. Say you own a dog. Now there happens to be a strong correlation (really) between being a pet owner and being a safe driver, and maybe an insurer finds a correlation between dog ownership and longer life too. The insurer purchases dog license records from myriad municipalities, and it prepares to offer a discount on life insurance policies to dog owners (this is a very simplified, hypothetical example, Lucker emphasizes). Yet when you seek the preferred life insurance rate (based on your dog ownership) you are denied. How could that happen? Well, the data are only 95 percent accurate. Five percent of the timeâ€”including this time—it’s wrong. This doesn’t seem fair, and you should be able to challenge this information in some way, says Lucker. But there is no easy way for insurers to fix errant data. They can’t go back and change every municipality’s dog records. “Doing that is very costly for all the disparate pieces of information” that would be used in the PA life underwriting process—of which there could be hundreds, if not thousands, of data points (dog ownership is just one data point that might be used), says Lucker. This is the sort of issue that concerns the FTC and others, and it presents a conundrum for life insurers. It’s one reason Lucker tends to view the glass “half empty“ rather than “half full” when it comes to PA and life insurance, and why he doesn’t see any dramatic breakthrough soon in life insurance underwriting. Life carriers, in fact, seem to be proceeding carefully on the PA front. VantisLife Insurance Company, for one, approaches PA with some caution, SVP Craig Simms, told us recently. The company wants more evidence that it really works—i.e., that the “mortality experience” when an insurer uses motor vehicle records and the like is similar to when it draws “fluids” and requires an attending physician's statement (APS). The APS is the “tried and true” route in life insurance underwriting â€“ and carriers aren’t about to cast that aside so fast, suggests Simms. That said, Vantis will soon offer simplified-issue whole life insurance policies for up to $100,000 making use of predictive analytics, and PA may eventually become a permanent part of the underwriting process, Simms allows. This would be a positive development, in Lucker’s view, because the middle-income and lower-income market segments in the United States are severely underserved from a life insurance standpoint. PA has the potential to make these under-insured markets viable (cost effective) again for life insurance companies, which would be good news for the life insurance industry—and for society in general, he says. Annuity fees are down, credit card fees are down, nuisance fees are down, consumer protection rules are tighter—and banks are hard pressed for fee income. That is why Dave Behrens thinks that banks are “in earnest” this time when they say they want to sell more life insurance to their retail customers. Senior bank management has long “paid lip service” to life insurance distribution, notes Behrens, executive vice president of American National Insurance Company (ANICO), but depository institutions today see their “biggest opportunity [in years] to get in front of that underserved market place,” with protection products like term life insurance. ANICO (Galveston, TX) has recently engaged in a “hefty mortality play,” with a line of new term life insurance products for banks that include “three living benefits,” terminal, critical, and chronic illness riders. To some extent, these are alternatives to annuities and single premium life insurance, which have become increasingly problematic for underwriters in the current low interest rate environment. Others see this as a propitious time for bank-sold life insurance. “The broker/dealer and banking channels represent the best growth engines in today's life marketplace,” says John Deremo, executive vice president and chief distribution officer for American General Life Companies (Houston). With tax rates expected to rise in 2013, including higher income taxes and estate taxes for the affluent and steeper payroll taxes (perhaps) affecting the “average Joe,” a ‘tax advantaged’ product like life insurance becomes more attractive. Thus Deremo anticipates: “More robust sales of life insurance” with “more growth on the protection side,” including term life and basic universal life insurance. In April, Deremo announced the consolidation of seven AIG life companies—among them, SunAmerica Annuity (Phoenix, AZ) and Western National Life Insurance (Amarillo, TX). They all became one company - American General Life Insurance Company. One of those companies, Western National, was long the top underwriter of fixed annuities sold through the bank channel. But with annuities in a slump—investors don't like the low credited rates, and insurance companies are wary about investing in long-term bonds, which fixed annuity underwriting requires—underwriters have to look elsewhere for business. “No question, that's part of it,” Deremo tells us. But there are other factors that favor bank-sold life insurance. Deremo sees younger producers in the bank channel—a plus—with the age of a typical rep in the low-40s, compared with mid- to upper-50s among the independent agent cohort. American General, too, has a “mature footprint” with brokerage general agencies (BGAs), which often assist institutions, and if banks don't use BGAs they can still draw on American General's extensive wholesaling network that has long worked with banks in annuities and mutual funds. The company has been “beefing up” this team recently. Nor is all the interest in the bank branch sales, either. More than half of ANICO's direct marketing business is now from financial institutions; its clients include three of the four largest U.S. banks, as well as regional institutions. The firm mails insurance solicitations to checking account and credit card customers, tracking things like propensity to apply, propensity to pay premium, etc. The percentage of ANICO's direct marketing business from banks—50-plus percent—is much higher than in past years. The bank channel is growing faster than other distribution channels percentage-wise, notes Behrens—if not in absolute dollars (because they are starting from a much lower base). Still, “The potential is there.” Whether people love banks or not, everyone has a bank. For the younger generation, it's all going to be Internet banking, says Behrens. Many may never set foot in a bank lobby. They will scan checks for deposit via their iPhones. And maybe, too, they will purchase their life insurance through banks. Deremo was asked about AIG's consolidation of its life insurance companies. Combining them will create “economies of scale,” he told us. But in places where the brand name is strong—like Western National with fixed annuities or SunAmerica in variable annuities—“we will keep those brands active.” Banks will still be dealing with Western National Life, in other words, and its wholesalers will still attend industry conventions under the Western National flag (although policy agreements will now read American General Life, not Western National). Banks have been on the verge of embracing life insurance for years, of course. What needs to happen for it to finally take? “Banks need to more openly embrace the role of life insurance in financial planning,” says Deremo. Financial planning isn't just about investments. It's also about protection. When it came to Regions Bank’s in-branch brokerage program, it was clear that something had to be done—especially after the bank sold Morgan Keegan, its broker/dealer (B/D), earlier this year. The only question was whether Regions, the nation’s 15th largest commercial bank, would build a new B/D from scratch or contract with a third-party marketing firm (TPM) to offer products like mutual funds, variable annuities, and advisory products to its mass affluent bank clients. Last week, the answer emerged: The Birmingham, Alabama institution has contracted with PrimeVest Financial Services (St. Cloud, MN) to “provide advisory and investment solutions, along with comprehensive support,” to Region Bank’s customers in 16 states. With $121 billion in assets, and 1,700 banking offices, Regions Bank is certainly large enough to build and support its own retail B/D. Virtually all the other ‘top 20’ banks have their own B/Ds. So why did Regions go the TPM route? It was to a significant degree a matter of time, Jim Nonnengard, executive vice president of Regions Investment Services, a division of Regions Wealth Management, told us. It would take 12-18 months, maybe even 24 months, to build a B/D from scratch. By signing with PrimeVest, with its existing operations systems, research, planning tools, advisory platform, risk mitigation processes, they might save at least a year—a critical difference given the “competitive landscape” facing enterprises today, he said. Regions had an unusual retail brokerage structure before the divestiture. Its “mass” retail client segment was covered by some 2,400 licensed bank employees (LBEs), who sold fixed annuities and life insurance on a part-time basis. Moreover, Regions’ LBEs did not sell mutual funds or variable annuities even though about 700 of them had securities licenses (the licenses were for referring customers). High net worth clients were served by Regions Bank’s private banking unit (currently led by Nick Stonestreet), and by Regions Trust, its legacy trust unit. As for the mass affluent customer—bank clients with between $100,000 and $1 million in investable assets—so coveted today by bank-owned broker/dealers, they had been covered by Morgan Keegan, often fueled by referrals from those licensed bank employees. Morgan Keegan’s sale to Raymond James left a big hole. Regions plans to hire 100 full-time financial advisors (FAs) by the end of 2013, and maybe more after that, Nonnengard told us. These will be seasoned advisors, many with experience selling in banks, though they may also tap wirehouse and independent brokerage reps. Some LBEs, too, may be promoted to full time advisors. “We really focus on the mass market,” says Nonnengard, who notes that 88 percent of his customers have an annual income of less than $75,000. He had only one sale of more than $1 million last year. The PrimeVest deal does not signify a shift away from the mass market. “We’ll take the 97 percent any day,” Nonnengard told us, referring to their largest client segment by households. But the bank doesn’t want to turn its back on the mass affluent segment, either. PrimeVest, which works with some 500 financial institutions, will be changing its name on December 1, 2012 to Cetera Financial Institutions. Meanwhile, other TPM/bank deals were announced last week. INVEST Financial Corporation (Tampa, FL) will provide brokerage and investment services for Lisle Savings Bank (assets: $565 million). “This relationship with INVEST will allow us to increase productivity, utilize advanced technology solutions and ultimately, continue to grow,” said James Renn, CEO of Lisle Savings Bank (Lisle, IL). And LPL Financial (San Diego), the largest TPM, announced that it added Alliant Credit Union (Chicago), the nation’s 6th largest credit union (CU), to its stable of 685 financial institutions. Launched in 2009 with a single advisor, Alliant’s brokerage program now has nine FAs, including three added this year. The credit union plans on adding two more in 2013, Laura Wallace, Alliant’s Vice President Branches and Retirement & Investment Services, told BISM. The CU operates coast to coast, but has a relatively sparse branch network--only 14 branches for $8.2 billion in assets. It has 90,000 ‘members’ who are beyond the orbit of any face-to-face advisor. Thus, Alliant will expand its call center distribution channel as well as its in-branch investments advisor force. One reason the credit union signed with LPL was to boost its fee-based investments business, which accounts for only 1 percent of investment program revenues, Wallace told us. (The program was previously managed by CUNA Brokerage Services.) Mutual funds, by comparison, account for about 40 percent of program revenues, with fixed and variable annuities comprising the balance. Wallace would like to raise the fee-based share to 5-10 percent over the next year. Founded in 1935 as the credit union for employees of United Airlines, the CU has many older and retired airline employees looking to plug the growing “income gap.” The standard savings rate offered at the credit union is now 0.8 percent. “They can’t live off that,” says Wallace. Advisory products look increasingly attractive these days. It’s all “part of a trend toward credit unions helping Americans with their financial plans,” Andy Kalbaugh, Managing Director at LPL Financial Institution Services, told BISM. So many banks are talking ‘fee-based’ these days, which is why the news out of Raymond James’ (RJ) management symposium earlier this month is worth a pause. After all, Raymond James’ Financial Institutions Division (FID) has been focused on boosting ‘fee-based’ investment revenue longer than most. FID, which provides brokerage services to some 200 banks and credit unions, completed a record year in terms of revenue and assets under management—now over $32 billion, division chief John Houston announced at the St. Petersburg, Fla., meeting. For the past 10 years, FID has been the fastest growing unit, in percentage terms, within Raymond James’ Private Client Group. Fee-based business now accounts for 28 percent of production at FID’s client banks, and recurring revenues—that is, fee-based revenues plus 12b-1 fees and trail commissions—account for 63 percent of division revenues. “Nearly two-thirds is recurring sources,” Houston told us last week. Raymond James Financial Services President Scott Curtis noted that FID had grown from $22 billion in assets at the end of 2009 to more than $32 billion at the end of September 2012. FID revenues grew 63 percent over the same period. FID advisor productivity has also grown from less than $250,000 in trailing-12 to almost $340,000, while new recruits are averaging $400,000 in T-12, he reported at the October meeting, FID’s ninth annual management symposium. Gathering and growing assets is a key Raymond James focus, according to Houston. If you gather assets, you view the client differently; you have a different relationship. It changes the whole dynamic. Advisors become more financial-planning oriented, and they tend to focus on the long-term relationship. Gathering assets “is part and parcel of our DNA,” Houston told us. The ‘trail’ element within FID’s revenue stream is illustrative. Trail commission revenues began to grow quickly about five to seven years ago after RJ capped advisor commissions on variable annuity (VA) sales at 5 percent. Anything over that had to be taken as a trail. This was at a time when VA commissions were high—in the 7 percent to 8 percent range—and Houston feared that advisors might be selling VAs for the “wrong reasons,” i.e., the higher commission rates. Fixed annuities and mutual funds, by comparison, were paying about 5 percent at the time. Not only did trails begin to grow, but advisors—at least some—became ‘true believers’ in recurring revenue, according to Houston. They began to take as little as 1 percent to 2 percent upfront—by choice—with the remainder as trailer. Most of FID’s current fee-based business is in mutual fund (MF) wrap accounts and ETF wraps, such as RJ’s “Freedom” mutual fund, which offers clients seven possible investment approaches, ranging from conservative to aggressive growth. Also popular is a fee-based account that is managed by the client and his/her advisor. Separate accounts, usually for more affluent clients, play a smaller role. Recently, RJ’s UMA (unified managed account) business has been picking up steam, Houston told us. Where does RJ’s bank division find its rep recruits these days? Wirehouses and national brokerage firms like Edward Jones are the preference. Other bank brokerage programs are a secondary source. “You really need a more experienced rep, one who has been around the block,” says Houston. FID reps have at least five years of experience and often 10 years or more. With regard to recurring revenue, “Many [of RJ’s 200 banks and credit unions] are 90 percent-plus,” says Houston, while some are doing little or none. The compound annual growth of fee-based business has been 24 percent a year, however, while total assets have increased at a 9.8 percent compound annual rate. We asked Houston where banks need to improve if they want to build a solid fee-based business. “Management at the bank level has to understand the importance of gathering assets, and create an environment that supports that.” If a bank can take some concrete steps along these lines, like paying bridge compensation as brokers transition from commission-based to fee-based business or funding more rep education programs or setting goals for advisors, then that will get them up to speed more quickly. This is part of a longer story on How Banks Can Better Compete in the Advisory Business that will appear in the upcoming Autumn 2012 issue of Bank Insurance & Securities Marketing (BISM) magazine (print edition). The low interest rate environment is forcing more banks to go â€˜fee-based,’ says Lori Hardwick, executive vice president, Advisory Services, Envestnet, Inc. (Chicago), that is, transitioning from commission-centric brokerage programs to platforms that offer bank clients investment â€˜advice’ for an annual fee. Envestnet’s phone lines have been “swarmed with new interest”from banks looking to build out their advisory platforms with products like mutual fund wrap accounts: How do I set up a proposal? How do I show this to a client? Etc. This is very different from past years, she tells BISM. To compete effectively with independent RIAs (SEC-registered investment adviser firms) and independent brokerage firms, however, banks need to reevaluate their fee structures. “Banks have notoriously charged more”for their products and services than other distribution channels, says Hardwick. “This is the No. 1 hurdle”that banks need to overcome if they want to continue to build out their advisory platforms, she suggests. Some bank-owned investment adviser (IA) firms are charging 3 percent annually on the first $500,000 for their managed account solutions. “That’s too high,”asserts Hardwick. “If you’re up at 3 percent, you’re completely uncompetitive,”agrees John Henry, president of OBS Financial Services, Inc.(Whitehouse, OH), an RIA and sub-advisor to banks and credit unions. Two percent should be the top end. Most of the firm’s financial institution clients are more in line with 1.5 percent (i.e., the total annual fee to the client). How did bank fees come to be so high? Annuity sales were long the staple of retail bank investment programs. Programs lived off those 5 percent gross commissions for years. But the current low interest rate environment has made annuity sales increasingly difficult because of the low crediting rates. Now banks are looking to develop advisory businesses, where the bank typically earns an annual feeâ€”not a commissionâ€”based on assets under management. Transitioning isn’t always easy. Reaping 1 percent annually for a $100,000 wrap account â€˜solution’ versus 5 percent for a $100,000 variable annuity sale is too precipitous a drop in revenue for some banks and bank advisors to stomach. Their response: seek a middle course—charging 3 percent for the advisory option (the lion’s share of which goes to the bank and its advisors). The problem is that consumers who choose to do business with an independent RIA or an independent brokerage firm can get a much better price for the same mutual fund wrap account or SMA (separately managed account), suggests Hardwick. Banks have been “living in a bubble with their inflated fee structures,”and that is holding banks back when competing with these other delivery channels. This is part of a longer story on mutual funds, ETFs and separate accounts that will appear in the upcoming Autumn 2012 issue of Bank Insurance & Securities Marketing (BISM) magazine (print edition). Are Market-linked ‘Notes’ Next For Bank Brokerage Programs? Market-linked certificates of deposits (MLCDs) have made significant inroads in bank investment programs over the past few years, particularly with the persistent low-interest-rate environment (LIRE). Recently, however, there has been talk of market-linked notes, often referred to as structured notes. Like MLCDs, structured notes are essentially bonds linked to an index, like the S&P 500, but unlike MLCDs, they don’t carry FDIC insurance. One has to rely on the creditworthiness of the issuer, which need not be a bank. Interest in ‘notes’ should only grow through 2012, adds Glenn Lotenberg, managing director, Structured Investments, Incapital LLC (Boca Raton, FL), “As interest rates continue to trend toward zero, investors seeking growth and/or income need alternatives.” CDs are harder to create in the current LIRE. “We believe the market-linked note business could increase 30-40 percent over the next year”—particularly as investors’ product knowledge continues to increase, he says. Scott Kerbel, managing director and head of U.S. Retail Structured Products, HSBC Bank USA (New York), a major manufacturer of MLCDs, also sees more demand lately for structured notes among bank clients. Why? The FDIC insurance that protects the investor’s principal in MLCDs can be expensive. With market-linked notes, by comparison, you don’t have that expense and might get a shorter maturity or a higher cap or a higher minimum guarantee. For instance, a seven-year CD “can be done as a five-year market-linked note with the same economics,” Kerbel tells Bank Insurance & Securities Marketing (BISM). Or alternatively, a seven-year note can have a higher minimum guarantee than a seven-year MLCD. HSBC is in a handful of banks with the structured note product now—big institutions, mostly—but mid-size banks are now beginning to dabble in the product as well. People see what happened to Bear Stearns, Lehman Brothers. What if they had purchased structured notes from those firms? There would be no federal government to bail them out. Moreover, the market-linked note is really more tailored these days to the high net worth (HNW) or ultra HNW bank client, suggests Ian Merrill, director, Investor Solutions, Barclays (New York), who often demand more esoteric products. They may want exposure to the Asian equity markets, for instance. The mass affluent, the primary target in most bank brokerage programs, by comparison, tend to be more conservative investors. They often need more tutelage—such as instruction in how the return is calculated with structured notes. CHOICE Savings’ COO IÃ±igo San Martin observes that there appears to be a correlation in the United States between affluence and “financial literacy.” The wealthy are more sophisticated, financially speaking, and thus are more likely to fully understand that “there is a risk of loss of some capital with [structured] notes.” The mass affluent are less aware. Regulators continue to look at suitability issues with regard to the sale of structured notes, adds Merrill. The onus is on the industry to conduct the proper education— “so it may be a long process” before structured notes reach the mass affluent bank client, if at all. But the LIRE could favor structured notes. “Market-linked notes and especially non-principal-protected notes are ideally suited for a low-interest-rate environment, where the zero coupon component of a market-linked CD is so expensive that it is almost impossible to create CDs with attractive terms,” says Lotenberg. As big in banks as MLCDs? Can market-linked notes ever be as big as MLCDs in banks, then? Yes, they can, in time, says HSBC’s Kerbel, although it will first require a concerted education effort on the part of banks and their partners. “It’s tough to say,” says Barclays’ Merrill, whether structured notes will ever be as big as structured CDs in banks. Much depends on macro-economic conditions. “There is a lot of potential growth given the sheer amount of money on the sidelines.” But will bank clients “veer away from the FDIC [insured] product?” Only time will tell. Last week, American National Insurance Company (Galveston, TX) introduced a new term life product, ANICO Signature Term, with multiple level premium periods of 10, 15, 20 and 30 years as well as annual renewable term with accelerated underwriting. The story behind the product, however, says something about the challenges facing banks and insurance carriers in the current low interest rate environment (LIRE). Last year ANICO hosted a bank insurance roundtable that included 8-10 large banks, as well as some marketing firms. Because of pricing changes on the part of carriers, the banks at the roundtable reported they were selling less single premium life insurance (SPL) than in past years. On the other hand, “There was a big need for term life,” David A. Behrens, Executive Vice President of American National Insurance Company, told BISM in an interview this week. ANICO had priced out a SPL product itself, but elected not to put it on the market. “We didn’t want all that cash,” recalls Behrens. It’s an industry quandary: A lot of bonds bought 10 years ago for 5-6 percent are now coming due. What does one do with the cash? What happens if I invest the money and then interest rates go up? Will I have to take a mark down if I’m an insurance carrier? A 1 percent drop in interest rates (assuming a 10-year duration on $1 billion) would mean a carrier using ‘mark-to-market’ insurance accounting principles would have to write down its portfolio $100 million. Last year ANICO did $1.5 billion in annuities. This year it will do half that—by choice. (They could do much more if they wanted.) But there is a dearth of “quality” places in which to invest those premium dollars, says Behrens, who doesn’t see this changing any time soon. He can envisage the yield on 10-year Treasurys going as low as 1% to 1.2% before rates rise again. Therefore, ANICO opted (instead of SPL) for a “true mortality play,” i.e., the new Signature term life insurance line, which has 48-72 hour turnaround on approvals with no medical exams (in most cases) and face amounts up to $250,000 for ages through 65. A lot of insurance carriers are struggling, of course, in the current low interest rate environment, and some—e.g., Hartford, Sun Life and John Hancock—have pulled out of the variable annuity market entirely. When Sun Life exited the VA market in December 2011, for instance, it said, among other things, that it wanted to pull away from long-dated guaranteed products. The LIRE has had an impact on suppliers to the bank insurance/brokerage industry in other ways. Lincoln Financial’s indexed universal life product has become its fastest growing life insurance product in the bank channel, mainly because of the low interest rate environment, according to Tom Tooley, head of Insurance Solutions Distribution at Lincoln Financial Distributors (LFD), the wholesale distribution subsidiary of Lincoln Financial Group (Philadelphia). The indexed universal life product is really a hybrid product. If one imagines a life insurance risk spectrum with “absolutely guaranteed” products at one extreme, and pure variable products at the other, then the indexed universal life (UL) product is somewhere in the middle. It has some guarantees but also offers some play in the equities market, a big draw at a time when 10-year Treasury notes are hovering around 1.5 percent (they were 1.60 percent on Monday). It, along with guaranteed UL and variable UL, are the firm’s top life insurance products in the bank channel, where Lincoln is focused mainly on the mass affluent and high net worth customer segments. The firm’s financial institutions channel is now its fastest growing life insurance channel, Tooley told us. Lincoln Financial, in fact, last week named Andrew DeLoreto national sales manager for its “newly created” Financial Institutions channel (within its Insurance Solutions Distribution business), which includes banks, wirehouses, and independent broker/dealers. Clients in financial institutions have lots of assets, and banks and others want to provide them with comprehensive planning, says Tooley, in explaining the need for a new dedicated channel. Life insurance is increasingly recognized as a “foundation of a good financial plan.” Before Lincoln had two separate wholesaling groups, each with more than 30 people, and two sales desks, each with more than 30 people, and all managed by different people. The new channel will enable the firm “to sharpen our focus on helping advisors grow their businesses,” notes Tooley. Where are things moving in bank investment programs with regard to fee-based revenue? Consider that 48 percent of the revenue generated by Wells Fargo’s 2,750 bank-based brokers in 2011 was fee-based. In 2012, that figure should rise to 60 percent, Wells projects. In most bank brokerage programs, by comparison, less than 10 percent of revenue is fee-based. Building a fee-based business doesn’t just happen, however, Egan says. It requires a real desire to make it work. Bank brokerage programs have to be willing to accept, for instance, that their revenues will be tied to the equities markets to a much larger degree than before. At Wells, says Egan, they conduct a prayer circle (figuratively speaking) about a month before the end of the quarter because their revenues are often determined by where the market ends up at the quarter's end. Firms have to accept, too, that financial advisors with fee-based practices have more "portable" books of business. That is, it is easier for them to take their clients with them if and when they decide to leave the bank. Third, with fee-based, it may be harder to distribute other products because the financial advisors often get out of the habit of selling transactional products like annuities and mutual funds. Fourth, it may change your relationship with vendors. Fewer FAs will be making product decisions with a fee-based business. Wells got into the fee-based business many years -- and acquisitions -- ago when First Union Corporation, a predecessor company, purchased Wheat First Butcher Singer, a brokerage firm that had a fee-based platform, in 1997. A fee-based business requires a lot of coaching and management attention, says Egan. A program manager will have to sit down with FAs and discuss how to get from Point A to Point B, he says. There are other keys to developing a strong program. "It starts with recruiting" if you want to be successful with fee-based business, says Frank Consalo, senior vice president, PNC Investments, another participant in the session. It may seem like a good idea to recruit a rep who is doing $500,000 in annual GDC, but if that rep is selling only annuities and mutual funds and has never considered selling fee-based products, it might not work out. "A lot of people just can't do it," adds Consalo. The bank might be better off going after that $300,000 rep who has been doing fee-based for several years. A bank also has to give some thought to where it will situate its fee-based advisors. You need to have the right people in the affluent branches, notes Fifth Third Bank’s Bob Corsarie. Fifth Third, for example, is sure to have a good fee-based advisor in its Naples, Florida branchâ€”Naples being a very affluent community. A longer version of this story will appear in the upcoming print edition (Spring 2012) of Bank Insurance & Securities Marketing magazine. NAPA, CA, June 15, 2011 — Essex National Securities, Inc. (“ENSI”) has announced the addition of Patrick Connelly as Senior Vice President, New Business Development. Windsor, CT, June 9, 2011 — Following a year of record-breaking highs, life insurance distributed through banks fell to a two-year low in the first quarter of the year, according to The Kehrer-LIMRA Life Report. Although 2010 was a strong year overall, in the fourth quarter sales began to slow. The 30 percent downturn in the first quarter of 2011 marks the second consecutive quarterly decrease. Declines were registered across all product lines and in both modes of payment in the bank channel. Sales have been adversely affected by actions taken in 2010 by three influential writers: one top carrier dropped out of the market, another dropped their flagship product, and a third implemented an underwriting change that resulted in a significant drop in sales. Apart from carrier-level actions, overall results have likely been impacted by the resurgence of annuities in the bank channel as the products tend to have an inverse relationship. “Whereas 2010 was a banner year for life insurance, it was the worst year for annuities in the past decade” said Jen ParmeleWitt, Kehrer-LIMRA’s associate research director. Throughout much of the year low fixed annuity interest rates adversely affected sales of fixed products and a variety of economic pressures reduced variable sales. However, according to the Kehrer-LIMRA Monthly Bank Annuity Sales Survey, annuities sold in financial institutions bounced back 22 percent in the first quarter, boosted by increases in both fixed and variable annuity production. Based on annualized premiums (planned recurring premium plus 10 percent of single premium), sales through banks dropped 38 percent in the first quarter after two years of solid increases. The bank channel had been the fastest growing distribution channel for life insurance for the past two years, based on annualized premium, according to LIMRA’s U.S. Individual Life Insurance Sales Report. In the first quarter of 2011 the bank channel was the fastest shrinking channel with a growth rate of -38 percent. While sales were off 29 percent, single-premium life insurance continued to account for most of the bank channel sales in the first quarter at 95 percent of new premium. Evanston, IL, June 2, 2011 — First quarter 2011 fixed annuity sales posted their first period-to-period increase in two years, rising 6% to $18.9 billion according to the Beacon Research Fixed Annuity Premium Study. There was growth in all four product types. Book value annuities advanced 12% to $8.6 billion. Market value-adjusted products (MVAs) were up 7% to $1.4 billion. Indexed annuity sales were $7.1 billion (a 0.2% increase), and income annuity results were $1.8 billion (up 0.8%). On a quarter-to-quarter basis, book value sales rose 42%, while MVAs improved 7%. Indexed and income annuities were down 15% and 7%, respectively. Sales increased 7% in total. American National was the new MVA sales leader. The other top companies by product type were unchanged: book value -- Western National, indexed -- Allianz, and income -- New York Life. Three of these companies also posted top distribution channel sales. Western National led in the bank channel. New York Life was the leading captive agent and large-regional broker-dealer (B-D) company. Allianz was the top independent producer carrier. Among the other channels, Nationwide was the new wirehouse sales leader. MassMutual and USAA continued as the dominant companies in the independent B-D and direct/third party channels, respectively. Among the 550 products tracked by the Study, three channel leaders had top five annuities as well. New York Life’s Secure Term Fixed Annuity was the new bestseller, and its Lifetime Income Annuity took fourth place. Allianz Life’s MasterDex X came in second. Western National rejoined the top five with Flex 7 in fifth place. American Equity’s Bonus Gold moved up a notch to come in third. Western National’s Flex 7 was the new bank channel bestseller, and Nationwide’s BOA Platinum Edge was the new leading product in wirehouses. The remaining channel leaders were continued top performers. TAMPA, Fla., May 24, 2011 — INVEST Financial Corporation today announced it will provide brokerage and investment services for Seacoast National Bank in Stuart, Florida. Seacoast National Bank is the operating arm of Seacoast Banking Corporation of Florida. With more than $2 billion in assets and 39 branches, it is one of the largest community banks headquartered in the state. INVEST currently supports more than 130 banks and credit unions and more than 1,100 representatives nationwide. It is a subsidiary of National Planning Holdings, one of the largest independent broker-dealer networks. Boston, MA, May 24, 2011 — Financial advisors and their clients would benefit from receiving more precise information about their existing immediate income annuity contracts, according to a new Retirement Income Industry Association (RIIA) survey released today and sponsored by MetLife, New York Life Insurance Company, and CANNEX Financial Exchanges. Windsor, CT, May 17th, 2011 — Total annuity sales through banks topped $4 billion in March, reaching the highest level since March of 2009. According to the Kehrer-LIMRA Monthly Bank Annuity Sales Survey, both fixed and variable annuities registered double-digit growth for the second month in a row. Financial institutions sold 31 percent more annuities in March than they did in February, which was 26 percent above January’s level of production. Combined fixed and variable sales in March were 27 percent higher than the $3.3 billion sold in the same month of the previous year. Variable annuities soared to a three-year peak in March, with sales reaching $2 billion in the bank channel. Sales increased 29 percent month-to-month and 36 percent above the prior March. Variable annuity sales lagged behind fixed sales for the third consecutive month. Fixed annuity sales at banks jumped 32 percent to $2.2 billion. Fixed sales for March were also 21 percent higher than March of 2010. Monthly sales of fixed annuities in financial institutions have not been over $2 billion since October of 2009 when we reported $2.5 billion in sales. Sales of fixed annuities continue to grow at banks even as the average effective yield remained level and CD rates rose. The spread between the yield on five-year CDs and the average effective yield offered by fixed annuities guaranteed for five years reached a 19 month high in mid-February of 43 basis points but by March the spread had slipped to 33 basis points. Mutual fund sales grew 4 percent from February to March. Banks sold $4.7 billion of mutual funds, 14 percent less than the previous March. Strong annuity sales squeezed mutual fund’s share of the sales mix down to 53 percent of packaged product sales, its lowest level since July of 2009. HOUSTON, May 17, 2011 — Western National Life Insurance Company has named Brett Giles Vice President, Insurance. A 20 year veteran of the financial services industry, Brett joins Western National Life from New York Life where he served as Regional Vice President and Retirement Income Specialist. Before that Giles headed one of the largest bank insurance programs in the country: He was Senior Vice President, Retirement Solutions at Guaranty Insurance Services. Western National Life Insurance Company, owned by AIG, is a Texas-domiciled life insurance company founded in 1944. Western National has been the number one provider of fixed annuities sold through financial institutions for 15 consecutive years1. NEWARK, NJ, May 13, 2011 — Prudential Annuities, the domestic annuity business for Prudential Financial, Inc. (NYSE:PRU), today announced that John Gies has been named national sales manager for its financial institution channel—one of four distribution channels that also includes the independent broker dealer, wirehouse, and agency channels. In this role, Gies will manage all aspects of the financial institution channel through a sales team of 27 wholesalers. He will report to Tim Seifert, vice president and director, National Sales. “John has played a vital role in driving Prudential Annuities to be No. 1 in variable annuity market share in the financial institution channel, while helping to maintain and expand our leadership position in the wirehouse channel. He also landed more than 25 new distribution relationships, a testament to the breadth and depth of his experience,” said Seifert. Gies brings more than 19 years of financial services experience to the position. With Prudential Annuities since 2006, he has served as vice president and channel director for the bank channel; vice president of financial institution business development and relationship management; and most recently, as vice president of the relationship management team supporting financial institutions, wirehouses, and regional broker-dealers. Prior to joining Prudential Annuities, Gies served as the leader of The Hartford's bank channel for distribution of Individual Life insurance products. Gies began his financial services career in 1992, and has been working with financial institutions since 1994, supporting their distribution of insurance and annuity products. Windsor, CT, April 15, 2011 — Total annuity sales through banks registered a 27 percent increase in February of 2011 to hit a high not seen since October of 2009. According to the Kehrer-LIMRA Monthly Bank Annuity Sales Survey, both fixed and variable annuities registered double-digit growth, a feat not achieved since last August. Financial institutions sold 27 percent more annuities in February than they did in January. Total sales of fixed and variable annuities surpassed the $3 billion mark for the first time since last spring. February’s $3.4 billion total was an impressive 33 percent higher than in February 2010. Variable annuities hit a nearly three-year high in February, posting 1.68 billion in sales. Sales through financial institutions were 24 percent higher month-to-month and 41 percent above the prior February. Despite the impressive growth, the amount of variable annuities sold fell slightly below that of fixed annuities for the first time since September. Fixed annuities reclaimed crucial lost ground in February. At $1.71 billion, fixed sales were 29 percent higher than the previous month and 17 percent higher than in February 2010. Fixed annuity sales have only reached this level of sales once in the past 16 months. Success with fixed annuities came as the interest rate corridor between fixed annuities and bank CDs expanded in February. The spread between the yield on five-year CDs and the average effective yield offered by fixed annuities guaranteed for five years reached a nadir in the summer of 2010, according to the Kehrer-LIMRA Bank Fixed Annuity RateWatch. Increases in the average fixed annuity interest rates were larger than that of bank CD rates, producing a gap of 43 basis points in annuities’ favor by mid February. Mutual fund sales showed a scant 3 percent improvement from January to February. Banks sold $4.5 billion of mutual funds, a 3 percent dip versus the previous February. Washington, DC —April 7, 2011: The BISA-Singer's Bank Holding Company (BHC) Annuity Index plunged 9 percent in the fourth quarter of 2010, the Bank Insurance and Securities Association (BISA) announced today. This follows a drop of 9 percent in the previous quarter. "Recent reports describe 2010 as the worst year for bank-sold annuities in the past decade, so the 4th quarter decline in the BHC Annuity Index comes as little surprise. Only two of the ten banks in the Index notched gains in the 4th quarter—Fifth Third Corp. and Wells Fargo. Without Wells Fargo, the aggregate numbers would have been down substantially,” observed Andrew Singer, editor of the Index. The Index is produced jointly by BISA and Singer's Annuity & Funds Report. During the fourth quarter, sales (not revenues) of the subset of fixed annuities across all depository institutions were an estimated $3.17 billion, according to the Beacon Research Fixed Annuity Premium Study. This was a decrease of 20 percent from the prior quarter and 48 percent compared with the fourth quarter of 2009. Windsor, CT, March 25, 2011 — In 2010, total annuity sales through banks hit lows not seen since the turn of the 21st century. Bank sales of annuities retrenched for a second straight year, posting a 25 percent decline from 2009, after falling 18 percent the prior year. Banks sold $33.2 billion of annuities in 2010, the lowest level since the $31 billion sold in 2000. “Although sales of annuities through financial institutions were a bit of a disappointment, the downturn in banks reflected declines in the broader annuity industry,” said Jennifer Parmelee Witt, Associate Research Director at Kehrer-LIMRA. Overall declines in the U.S. individual annuity industry, coupled with a larger slide in the bank space, pushed the bank share of total sales down to 15.4 percent. The last time the bank channel’s share of total annuity sales were this low was in 1998. Meanwhile, fixed annuities suffered a wrenching year, driven by lackluster interest rates and inflationary fears brought about by the Federal Reserve’s quantitative easing policy. At $16.9 billion, fixed annuity sales through banks were not at historically low levels, but they were at the lowest level of the past decade. Compared to the prior year, fixed annuity sales at financial institutions were nearly halved. The share of fixed annuities sold through financial institutions dropped to 22.5 percent, nearly half of the all-time high of 40.1 percent achieved in 2001. The bank channel’s market share of fixed annuity sales in 2010 was the lowest it has been since 1995. Windsor, CT, March 24, 2011 — Banks sold a record $1.8 billion in life insurance premium in 2010. This new peak is nearly 40 percent higher than the previous record of $1.3 billion set in 2004 according to the fourth quarter 2010 Kehrer-LIMRA Life Report. Sales did falter however in the fourth quarter easing 21 percent making it the first quarter-to-quarter decrease in seven quarters. p>In the third quarter of 2010 banks sold $512 million of life premium. By the fourth quarter that number was $406 million. The decline is partially due to the fact that Allstate recently exited the bank market in order to increase focus on their P&C business, and distributing life insurance as part of a tri-line strategy (auto-home-life) through their Allstate agents. In addition Transamerica dropped their flagship single premium universal life product from the bank channel. Single premium policies were behind the vast majority of the recent boom in bank life sales. “Over the past several years carriers have done a good job supporting the bank rep’s transactional culture with simplified products and processes, especially single premium wealth transfer products. The hope is that this strategy serves as a â€˜gateway drug’ which gets bank reps comfortable selling other types of life insurance as well” said Scott Stathis, managing director of Kehrer-LIMRA. “If you’re an optimist the recent 31 percent increase in bank recurring premium sales from Q3 to Q4 2010 could be an indicator of this evolution” Stathis added. Another factor that has boosted bank life sales has been the low interest rate environment which has caused the spread between fixed annuities and certificates-of-deposit to narrow. The resulting decreased customer interest in fixed annuities -- a typical go-to product in the bank channel -- has prompted reps to focus more on promoting life insurance. “Simplified single premium life products have filled the void left by diminished fixed annuity sales” said Stathis. Universal life products represented 46 percent of bank life insurance sales in 2010 and whole life represented 52 percent of the premium mix. The remaining balance was split between term and variable universal life. 2010 marked the first time in the last decade that whole life contributed more than half of the premium sold through banks. Bank whole life premium sales grew by roughly 90 percent for the year, and this impressive growth was on top of a 30 percent year-over-year increase in 2009. Windsor, CT, March 10th, 2011 – Annuity sales through banks dipped slightly in January, according to the Kehrer-Jackson Monthly Bank Annuity Sales Survey. Fixed and variable annuities both reversed course and the sum was slightly below December’s total. Financial institutions sold $2.7 billion of fixed and variable annuities in January, 3 percent below December. Sales have inflated 24 percent since the previous January’s historic low of $2.2 billion. Variable sales in the bank channel weakened in January, returning to levels prior to the fourth quarter surge. Financial institutions sold $1.4 billion in VAs, which represents a 14 percent drop from December’s performance and a growth rate of 28 percent over the previous January. In January, banks sold $1.3 billion of fixed annuities, a rebound of 13 percent from December after fixed sales shrank in the fourth quarter. This improvement followed a rise in interest rates for three consecutive months, which put some space between fixed annuity rates and bank CD rates. According to the Kehrer-LIMRA Bank Fixed Annuity RateWatch, the spread between the yield on five-year CDs and the average effective yield offered by fixed annuities guaranteed for five years hit rock bottom in 2010 and has bounced back somewhat as of January. Since November of 2010, the average fixed annuity interest rates have risen at a faster clip than bank CD rates and as of mid-month, the difference between the two products was 39 basis points. The gap between the two has not been this high since August of 2009. Mutual fund sales lost some steam in January, and bank production fell to its lowest level since May of 2010. Even though sales levels of annuities also slipped in January, mutual funds only represented 62 percent of the sales mix (not to be confused with revenue mix), the lowest level since May of 2010. Banks sold $4.4 billion in mutual funds in January, a 6 percent reduction from the $4.7 sold in December and 11 percent behind sales from the previous January. Evanston, IL, March 8, 2011—Fixed indexed and income annuities broke sales records in 2010, according to the Beacon Research Fixed Annuity Premium Study. Annual indexed annuity results climbed 6% to an estimated $31.4 billion. Income annuity sales grew 2% to $8 billion. Each product type also claimed its largest share of sales in the Study’s 8-year history -- 48% for indexed and 11% for income annuities. Western National led in bank channel sales of fixed annuities in the 4th quarter, Beacon reported. Fixed rate annuity results were negatively affected by 2010’s unfavorable interest rate environment. Annual book value sales dropped 49% from 2009 to an estimated $26.5 billion, while market value-adjusted products slid 61% to $5.8 billion. Fourth quarter’s book value sales were $5.6 billion, down 38% and 19% from the year-ago and prior quarters, respectively. MVAs fell 29% relative to both periods, to $1.3 billion. While 2010 was a difficult year for banks to sell annuities, there are glimmers of hope for 2011, Kehrer-LIMRA reports. The first half of 2010 saw dramatic swings in the volume of annuities sold through banks. The year began with sales at a five-year low of just $2.2 billion. Throughout the first quarter, sales were building, reaching $2.6 billion in February and $3.3 billion in March the highest level of the year. In the second quarter, production continued to fluctuate as sales dipped 13 percent to $2.8 billion in April before rising 18 percent to a quarterly high of $3.1 billion in May. June’s sales were down 8 percent, but at $2.9 billion were still higher than in April. In the second half of the year, bank sales of annuities appeared to be fairly stagnant ranging from $2.5 billion to $2.9 billion. However, the total figures masked important changes in the product mix. In January, sales of fixed and variable annuities were about even with banks selling $1.11 billion in fixed annuities and $1.06 billion in variables. Since January of 2008, fixed annuity sales outpaced variables sold in financial institutions, but in September VA’s pulled ahead as banks sold 13 percent more variable annuities than fixed. It was a difficult year for fixed annuities, which peaked in March at $1.8 billion and slowly declined throughout the year, reaching a stable nadir in the fourth quarter. Variable annuity sales remained somewhat flat at financial institutions throughout 2010, but the momentum seemed to shift as the year came to a close. While fixed annuity sales were steady throughout the fourth quarter, VA sales grew each month and by December, production was 33 percent ahead of September levels. Although annuities sold through banks struggled throughout 2010, there are reasons to be hopeful in 2011. Variable annuities seem poised for growth. With the recession waning, and the reign of fixed annuities coming to a close for the time being, VAs are likely to capitalize on the recent bull market. Historically there has been a correlation between variable sales and the Dow Jones. With the Dow hitting, and surpassing, the 12,000 mark, variable annuities will most likely benefit from the positive momentum. Meanwhile, as interest rates start to recover, fixed annuity sales should also benefit. In the past year, the rate spread between the yield on five-year CDs and the average effective yield offered by fixed annuities reached a low of negative 16 basis points in June 2010, according to the Kehrer-LIMRA Bank Fixed Annuity RateWatch. November saw the spread reach positive territory again and as we moved into January 2011 the average effective yield on five year products was 39 basis points above CD offerings for five year commitments. “When you combine the likely positive effect of the recent equity markets on variable sales with the benefits of increasing fixed annuity/CD rate spreads on fixed annuity sales, the ultimate result could be a very positive 2011 for total annuity sales” said Jennifer Parmelee Witt, Associate Research Director at Kehrer-LIMRA. Symetra Life Insurance Company today announced a new sales leader for national accounts and five new regional vice presidents to represent Symetra’s retirement and life insurance products in select territories across the country. These new hires are part of the company’s strategy to expand its distribution network and strengthen partner sales support. John Richter has been named vice president of National Accounts, with responsibility for managing the distributor relationships that drive the majority of Symetra’s life insurance and annuity sales, including major bank partners, national brokerages and large general agencies. Most recently, Richter was head of key accounts for the Retirement Income business at MassMutual Financial Group. Before MassMutual, John spent nearly 10 years at ING, where he introduced ING annuity distribution in the bank channel. Richter earned a Bachelor of Science degree at Charleston Southern University and received enterprise management credentials from Columbia University Business School. He has served on the Leadership Advisory Board of Bank Insurance & Securities Association (BISA), Insured Retirement Institute (IRI) Committees, and the Roundtable Advisory Committees of Kehrer-LIMRA. Jeremy Alyea (Territory: Michigan) — Alyea joins Symetra from RiverSource Annuities, where he served as a regional vice president in the bank, wirehouse and broker-dealer division. He also has held sales positions with Allstate Financial Distributors, Harris Bank and Scudder Kemper Investments. His background includes wholesaling experience with annuities, life insurance and mutual funds. Michael Hickey (Territory: Delaware, Pennsylvania) — Hickey is an experienced annuity and life insurance sales professional, having held external wholesaling positions at American General Life Companies, MassMutual Financial Group, Inc., and Phoenix Life Insurance. He also was a wealth management financial consultant at National Penn Investment Services. Stephanie Schuler (Territory: Colorado, Arizona, New Mexico, Utah) — Schuler brings 10 years of experience as a successful external and internal wholesaler at RiverSource Distributors, Inc., Wood Logan (John Hancock) and Janus International. In addition, she served as a portfolio manager at Centrix Financial. Sales of annuities through banks in December ended the year with a promising lift, specifically for variable business. According to the Kehrer-Jackson Monthly Bank Annuity Sales Survey, fixed annuity production was relatively stable but variable sales continued on their upward trajectory, recording increases each month in the fourth quarter. Financial institutions sold $2.7 billion of fixed and variable annuities in December, a 4 percent increase which was about the same growth rate experienced in November. This slow but steady increase brought total production up to within 7 percent of the previous December. Total annuity sales have grown 24 percent since the low in January 2010. In December of 2010, bank-sold variable annuities continued to recover and at $1.6 billion have grown 21 percent year-over-year. December production was a 6 percent improvement over November, which was the second consecutive month of growth. Sales reached this level in the spring of in 2010 but have struggled for several months. The disparity between variable and fixed sales continued to increase. The sales ratio in December surpassed November’s three year high as banks sold $1.48 in variable annuities for every dollar of fixed annuities. Banks have been selling more VAs than fixed annuities since September and the gap is widening. The turnabout is evident when considering the fact that banks sold only $.84 in variable annuities for every dollar of fixed annuities in December of 2009. Bank-sold fixed annuities reached $1.08 billion, which was a nominal increase over November’s $1.07 billion. Financial institution sales of fixed annuities have lingered at about $1.1 billion for the entire fourth quarter. “Fixed annuity production has been flirting with historic lows, but so far have been able to stay above the bottom,” said Janet Cappelletti, Associate Research Director at Kehrer-LIMRA. The spread between the yield on five-year CDs and the average effective yield offered by fixed annuities guaranteed for five years continued to grow, according to the Kehrer-LIMRA Bank Fixed Annuity RateWatch. In the past year, the rate spread was as high as 24 basis points in December 2009 and steadily fell to a low of negative 6 points in May 2010 but reversed course in November and as of December 15th, the average effective yield on five year products was back up to 34 basis points above CD offerings for five year commitments. “The rate spread between fixed annuities and like CDs is becoming meaningful. We are all now waiting to see when the inevitable corollary sales increase will come” said Scott Stathis, Managing Director of Kehrer-LIMRA. Washington, DC - January 14, 2011: The BISA-Singer's Bank Holding Company (BHC) Annuity Index plunged 9 percent in the third quarter of 2010, the Bank Insurance and Securities Association (BISA) announced today. The Index is an average based on quarterly annuity (both fixed and variable) revenues (not sales) at 10 large bank holding companies as reported to the Federal Reserve Board. The index fell from 102 in the second quarter to 93 in the third quarter. Aggregate annuity revenue at the 10 bank companies covered decreased 7 percent to $283.32 million from $305.54 million in the previous quarter. “After a strong 2009, banks continued to struggle with fixed annuity sales in 2010. Seven of the ten banks in the Index experienced a drop in annuity production in the quarter. Only BB&T Corp., Fifth Third Corp., and SunTrust Banks registered gains,“ observed Andrew Singer, editor of the Index. Sales of annuities through banks in September seem to have lost their momentum after hitting a peak for the year in March. According to the Kehrer-Jackson Monthly Bank Annuity Sales Survey, variable sales maintained Augusts’ levels but fixed annuity sales sank, driving total annuity sales down. Financial institutions sold $2.6 billion of fixed and variable annuities in September. This represents an 8 percent drop for the month and was 17 percent behind the previous September when fixed annuities compensated for stalled variable sales at banks. Bank-sold fixed annuity production tumbled 17 percent in September, to $1.2 billion, the lowest level since January. Compared to last fall’s rally, fixed annuity premium was 41 percent below that of September 2009. "This is the first time we’re seeing fixed annuity sales fall below variable in the bank channel in several years." said Janet Cappelletti, Associate Research Director for Kehrer-LIMRA (Windsor, CT). "The last time variables outsold fixed annuities at financial institutions was January of 2008. "She continued, "Variable sales in September were flat, but fixed annuities really fell behind." According to the Kehrer-LIMRA Bank Fixed Annuity RateWatch, the spread between the yield on five-year CDs and the average effective yield offered by fixed annuities guaranteed for five years is still under water. The difference between the two products fell from 37 basis points in September 2009 to negative 10 points in September 2010. This means that the average yield on five-year guaranteed fixed annuity was 10 basis points below five-year CDs. "We have seen slight upwards pressure on fixed annuity rates lately", said Scott Stathis, Managing Director of Kehrer -LIMRA. "It seems investors have returned to the sidelines for now in hopes that a brief wait will provide a few more basis points" he added. Variable annuity sales maintained summer levels into the fall. In September banks sold $1.4 billion in variable annuities, consistent with August. Year-to-year the September 2010 sales represent a 28 percent jump over last September when variable annuity sales at banks lingered at $1.1 billion for much of 2009. Banks sold $0.88 in fixed annuities for every dollar of variable annuities in September. At the start of the year, this ratio stood at $1.05 to one and continued to rise before spiraling in the third quarter to under a dollar. 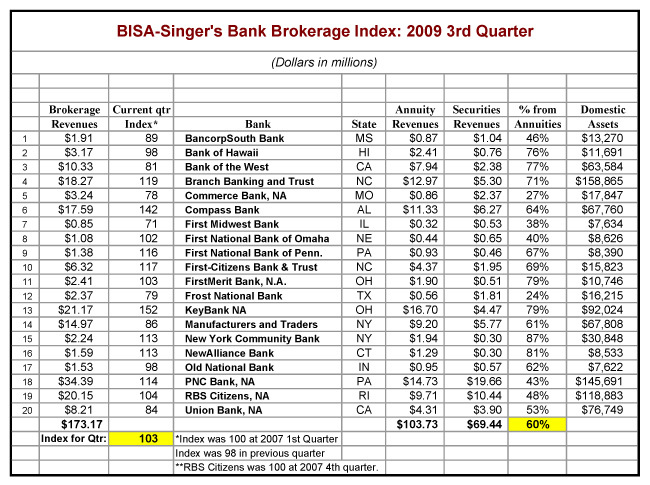 The BISA-Singer's Bank Holding Company (BHC) Annuity Index increased 7 percent in the second quarter of 2010. The Index is an average based on quarterly annuity (both fixed and variable) revenues (not sales) at 10 large bank holding companies as reported to the Federal Reserve Board. The index rose from 95 in the first quarter to 102 in the second quarter. Aggregate annuity revenue at the 10 bank companies covered increased 12 percent to $305.54 million from $273.92 million in the previous quarter. "Even excluding the boost to the Index from the merger of National City and PNC, the second quarter results were positive. Seven of the ten banks in the Index were able to register overall gains in the quarter. Only four did so in the previous quarter. Indeed, four banks (PNC, U.S. Bancorp, BancWest Corp, and Huntington) reported double-digit gains," commented Andrew Singer, editor of the Index. nbsp;Windsor, CT, September 16, 2010â€¦. Bank sold annuities took a dip in July, backing down from what seemed to be a recovery from the record lows set earlier in the year. According to the Kehrer-Jackson Monthly Bank Annuity Sales Survey, variable sales sank, but fixed annuity sales were flat for the month. Financial institutions sold $2.7 billion of fixed and variable annuities in July, which was only slightly higher than February production. Annuity sales for the month were 7 percent short of June’s $2.9 billion but a full 25 percent below July of 2009 when production was riding high at $3.6 billion. Fixed annuities sold in financial institutions maintained June levels in July, which were 37 percent higher than the start of the year but 39 percent below July of the previous year. Year-to-date fixed annuities at banks peaked in March, but have been in slow decline since. "With 2008 as the exception, fixed sales at banks generally don’t surprise us in July", said Janet Cappelletti, Associate Research Director at Kehrer-LIMRA. "For the past six years, on average, the difference between June and July fixed sales at banks is only about 1.5 percent, whereas in March, when a high percentage of CDs mature, we expect a lift of 20 to 30 percent." The spread between the average 5-year effective yield on fixed annuities and interest rates offered by five-year CDs continues to diminish over the past year and a half, according to the monthly Kehrer-LIMRA Bank Fixed Annuity RateWatchTM,. The rate spread was 155 basis points in mid January 2009. By mid January of 2010 it dropped to just 21 points. In May, the spread inverted and as of mid July, the yield was 8 basis points below CD offerings. "History has shown that fixed annuity rates alone do not affect sales. Instead it is specifically the rate spread between fixed annuities and CDs of like terms that affect sales. We don’t expect to see much improvement in fixed annuity sales until either the rate spread shows signs of improvement, or product innovations like the LTC-annuity combo products start gaining momentum" said Scott Stathis, Managing Director of Kehrer-LIMRA. In July of 2010 banks sold $1.2 billion in variable annuities. Year over year, July 2010 recorded an increase of 7 percent. However, bank sales of variable annuities in July were 15 percent below the previous month’s sales and 22% below May’s two-year high of $1.5 billion. Banks sold $1.29 in fixed annuities for every dollar of variable annuities in July. At the start of the year, this ratio stood at a record low of $1.05 to one. The ratio had been over $2 to one for most of the period between August of 2008 and October of 2009, reaching an apex of $5,00 in January 2009 at the height of the financial crisis. Mutual fund sales sagged in July with a 17 percent drop for the month. The Dow climbed back over ten thousand, but market volatility continued for much of the month amid concerns about sluggish economic recovery. Banks sold $4.2 billion in mutual funds in July, the lowest production we’ve seen in a year. Mutual fund sales have hit the $4 billion mark every month since July of 2009 when they were at $3.5 billion. Although mutual fund sales are down 15 percent for the year, they have increased 21 percent over the previous July. Due to lackluster annuity production, mutual funds still accounted for 60 percent of packaged product sales in July. Wells Fargo Private Bank (San Francisco) announced today the leadership team for its newly established national life insurance business group. Stan Gregor, head of the Eastern markets for Wells Fargo Private Bank, will oversee the insurance business nationally for Wells Fargo’s wealth management division in addition to his current responsibilities managing The Private Bank’s Eastern region. Leading the insurance team is Robert Chewning, national insurance sales manager for Wells Fargo Private Bank. Reporting to Chewning are four senior directors of life insurance, newly created positions responsible for leading regional insurance teams that focus on the high-net-worth and affluent market segments. "As Wells Fargo Wealth Management and Wachovia Wealth Management continue to integrate their businesses, life insurance remains an integral part of our wealth management offering to clients," said Gregor. "Typically following an economic downturn, business owners and wealthy individuals return to the fundamentals with a desire to refocus on life insurance as a way to manage their risk. Rob Chewning has put together a quality team of insurance experts who can help our clients with their complex needs. With our new business model in place, we will be well-positioned to serve clients for the increase in insurance demand that we anticipate during the recovery." David Coggins will be senior director of life insurance for the Mid-Atlantic and Carolinas regions. Previously, Coggins developed The Insurance Academy, LLC as a consulting and training firm specializing in helping institutions and insurance carriers develop and grow insurance distribution. Prior to that, he was the director of insurance services for Fifth Third Bank. Dennis Tygart will be senior director of life insurance for the Southeast and Florida regions. Previously, Tygart was managing director of wealth management for First National Bank. He also has held senior management positions at American Express Financial and AXA Equitable. Matt Curran will be senior director of life insurance for the Northeast and PennDel regions. Previously, Curran was the East Coast sales manager for Lincoln Financial Distributors’ banking and brokerage division. Prior to his tenure at Lincoln Financial Distributors, he worked for US Allianz and MetLife Financial Services. Steve Matter will be senior director of life insurance for the Western region. Previously, Matter was the national sales manager for Smith Barney’s insurance group. He also has held management roles at E.F. Hutton, Merrill Lynch and Paine Webber. "Al will lead the service team in enhancing the companies’ strong customer service culture and play an important role in setting our strategic direction," said Peter Dunlap, president and chief executive officer of Huntington Insurance. "Al’s background in sales and marketing, business development, underwriting and process improvement, combined with his extensive knowledge of process and technology, position him to provide outstanding leadership for Huntington Insurance," added Dunlap. Thomas has more than 18 years of experience in the insurance industry. He began his career with Sentry Insurance in 1992 as a commercial underwriter. He also served as an underwriting director for several companies, including Kemper Insurance Companies and The St. Paul Companies. Most recently, he was president and managing director of the Minnesota division of a leading global insurance broker. Thomas holds a bachelors of science degree in management and finance from University of Wisconsin-Stevens Point. Fifth Third Securities recently hired three experienced financial professionals, Michelle Griffith, Bradley Grubb and Britt Woods, to lead brokerage and insurance operations for three key markets in the Midwest and the South. "We’re fortunate that high-level talent like Michelle, Bradley and Britt chose Fifth Third Securities as their home," said Howard Hammond, senior vice president and CEO of Fifth Third Securities. "We’re excited to have them on board and look forward to the three providing their experience to our markets." Grubb, a 22-year veteran of investments and insurance, will serve as Area Sales Manager for the Western Ohio market. Most recently, Grubb was president and CEO of BancWest Investment Services headquartered in California. Grubb was responsible for combining brokerage operations and successfully relocating the investment services’ corporate headquarters. Griffith, a 17-year financial industry veteran with a Fortune 100 institution, will serve as Area Sales Manager in the Chicago area. Griffith began as a sales assistant with her former institution and worked her way to managing more than 20 advisors in the firm’s Chicago office. Brokerage revenues are comprised of two groups: annuities ("fees and commissions from sales of annuities") and securities ("fees and commissions from securities brokerage activities") as reported to the FDIC. The BISA-Singer's Bank Holding Company (BHC) Annuity Index advanced 3 percent in the third quarter of 2009, the Bank Insurance and Securities Association (BISA) announced today. The Index is an average based on quarterly annuity (both fixed and variable) revenues (not sales) at 10 large bank holding companies as reported to the Federal Reserve Board. The index increased from 106 in the second quarter to 109 in the third quarter. Aggregate annuity revenue at the 10 bank companies covered was virtually unchanged—$292.36 million compared with $293.08 million in the previous quarter. 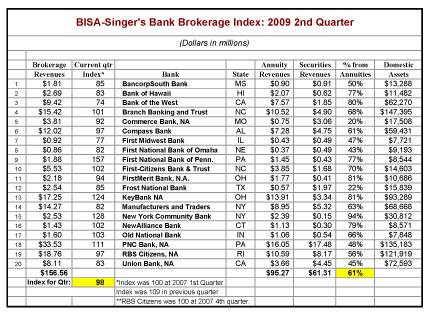 Bank Brokerage Index increased 5 percent in the third quarter of 2009. The Index is an average based on quarterly brokerage revenues at 20 operating banks (see table above) with established retail investments programs. It sets 2007 1st quarter as a baseline (100). The index rose from 98 in the second quarter of 2009 to 103 in the third quarter of 2009. Aggregate brokerage revenue of the 20 banks covered increased 9 percent—from $156.56 million to $173.17 million. Fourteen of the 20 banks in the Index improved their brokerage performance in the 3rd quarter. Big gains were notched by Compass Bank (up 46 percent), First National Bank of Omaha (up 26 percent), KeyBank (up 23 percent), and Branch Banking & Trust (up 18 percent). "Aggregate securities revenue increased 13 percent in the quarter, following a gain of 13 in the previous quarter," said Heywood Sloane, Managing Director of the Bank Insurance and Securities Association. "Annuity revenues increased 9 percent." Wells Fargo (CA), BB&T (NC), and BancorpSouth (MS) were among those named today to the Bank Insurance Market Research Group’s (BIMRG) 5-year Bank Insurance Honor Roll. Announced on the eve of publication of the fifth annual edition of the group’s Who’s Who in Bank Insurance (WWBI), the industry’s leading bank insurance study, the awards are for top bank insurance performance sustained over a five-year period. To qualify, bank insurance programs had to register brokerage revenue growth every year between fiscal 2004 and 2008—with at least 40 percent revenue growth over the entire five-year period. 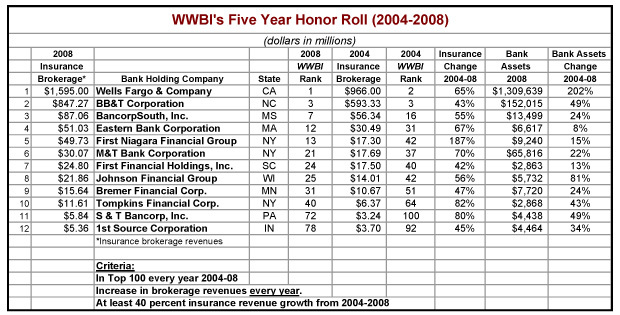 They also needed to remain among the top 100 bank insurers in WWBI’s annual survey each year during the period. Also named were Eastern Bank Corporation (MA), First Niagara Financial Group (NY), M&T Bank Corporation (NY), First Financial Holdings (SC), Johnson Financial Group (WI), Bremer Financial Corp. (MN), Tompkins Financial Corporation (NY), S&T Bancorp, Inc. (PA), and 1st Source Corporation (IN). "Despite a â€˜soft’ insurance market through much of the period, and a severe recession over the past two years, these 12 bank programs were able to sustain annual insurance growth," said WWBI Editor Andrew Singer. "At a time when many other banks have headed for the doors, these banks have maintained their commitment." Wells Fargo (ranked #1 in WWBI’s 2009 edition), BB&T (3rd), and BancorpSouth (7th) "have maintained growth through a steady diet of insurance agency acquisition," said Singer, "but others on the list, such as Bremer Financial, Johnson Financial, and Tompkins Financial have done so mostly through organic growth." While insurance kept pace with bank asset growth over the five-year period at some institutions (e.g., BB&T), at others, insurance far outstripped asset growth. Balance sheet assets increased at Eastern Bank by only 8 percent from 2004-2008, but insurance brokerage revenues rose 67 percent. Assets at First Niagara rose 15 percent, while insurance revenues soared 187 percent. First Financial Holdings grew assets 13 percent but insurance brokerage revenues increased 42 percent. The table above is from the fifth annual edition of Who’s Who in Bank Insurance (WWBI), which will be published in early December. The study is distributed each year by the Bank Insurance & Securities Association (BISA) and is sponsored by Prudential, Symetra, and INVEST Financial. (November 25, 2009). The BISA-Singer's Bank Holding Company (BHC) Annuity Index fell 15 percent in the second quarter of 2009. The Index is an average based on quarterly annuity (both fixed and variable) revenues (not sales) at 10 large bank holding companies as reported to the Federal Reserve Board. The index fell from 125 in the 1st quarter to 106 in the second quarter. Aggregate annuity revenue at the 10 bank companies covered declined 11 percent—from $330.76 million to $293.08 million. "This marks the largest slump in the Index since we began tracking annuity revenues in the 1st quarter of 2007," said Andrew Singer, editor of the Index. "In the second quarter, all ten bank companies experienced annuity declines compared with the previous quarter." INVEST Financial Corporation (Tampa, FL) announced that it has named Steve Dowden president and chief executive officer. Dowden succeeds Lynn Niedermeier, who retired in July after serving as the firm’s president and CEO since 2001. Dowden, 48, joins INVEST from CUNA Mutual Group, an investment and insurance company serving the credit union industry. As senior vice president of distribution and president and CEO of CUNA Brokerage Services, Inc., he led a sales force of 550 advisers and was responsible for all sales within CUNA’s Asset Accumulation division. The Index is an average based on quarterly brokerage revenues at 20 operating banks (see table below) with established retail investments programs. It sets 2007 1st quarter as a baseline (100). The index fell from 109 in the 1st quarter of 2009 to 98 in the second quarter of 2009, the first time the Index has slipped below 100. Aggregate brokerage revenue of the 20 banks covered fell 6 percent (see table below)—from $166.74 million to $156.56 million. Only four of the 20 banks in the Index improved their brokerage performance in the 2nd quarter. "Aggregate annuities revenue plunged 15 percent in the quarter, which accounted for the brokerage decline—since annuities account for 61 percent of brokerage revenues," said Heywood Sloane, Managing Director of the Bank Insurance and Securities Association. Annuities accounted for 68 percent of brokerage revenues in the previous quarter. A resurgent stock market largely accounted for the 13 percent gain in aggregate securities revenues at the 20 banks in the Index. Investment Centers of America, Inc. (ICA) today announced (August 20) that J.J. Hudock has joined the firm as vice president of new business development. In this role, Mr. Hudock is responsible for marketing ICA’s business capabilities to independent offices and financial institutions. He is based in Charlotte, N.C.
Mr. Hudock joins ICA from UVEST Financial Services, where he served as vice president of business development since 2002. His 13 years of experience in the industry also includes positions in insurance sales management and mortgage lending. Mr. Hudock is a graduate of George Washington University and holds FINRA Series 6 and 63 registrations, as well as life and health insurance licenses. Banks that sell insurance make more money than banks that don’t. That was borne out again in 2008—even amidst the Great Recession. This conclusion follows analysis of 2008 bank data by the Bank Insurance Market Research Group. Examining FDIC call report data, BIMRG found that banks with some insurance activity had 69 percent higher (median) net income in 2008. In 2007, net income was 44 percent higher. This trend toward higher (median) net income persisted in all asset-size groups with the exception of the largest banks where there was no difference. Among 470 banks with $1 billion to $10 billion in assets, for instance, those with some insurance activity in 2008—about half the total—scored 23 percent higher in (median) net income (see table below). The trend was more pronounced in smaller banks. "Overall median net income was off 36 percent in 2008 compared with 2007. Nonetheless, the data suggests that pursuing a diversification strategy—of which insurance brokerage is often a key part—may have again paid off for banks in 2008," said Andrew Singer, Managing Director of the Bank Insurance Market Research Group, "particularly at a time when banks’ traditional income sources are under pressure. An insurance agency business can help smooth out earnings and act as a hedge against interest-rate volatility." Overall, the median net income at 7,563 operating banks and savings banks was $686,000 in 2008, down from $1,071,000 in 2007. The median at 3,338 banks and savings banks that reported some insurance activity—less than half (44%) of the total number of banks—was $1,160,000. The largest discrepancy again was in the smallest banks. Median net income at 5,243 banks with assets less than $250 million was $469,000 in 2008. (That is, the middle ranking bank in this asset-size group reported $469,000 in profits.) Among the 2,136 with some insurance activity, however, the median was $825,000—76 percent higher. "Compared with what happened in the rest of the economy in the 4th quarter, this can be viewed as a victory for bank-sold annuities," said Andrew Singer, editor of the Index. GDP fell at a 6.2 percent annual rate, its worst quarter since 1982, and the S&P 500 Index plunged 22 percent in the 4th quarter. The Index is an average based on quarterly annuity (both fixed and variable) revenues at 10 large bank holding companies (see table above) as reported to the Federal Reserve Board. The index declined from 118 in the 3rd quarter of 2008 to 115 in the fourth quarter (see chart below). Aggregate brokerage revenue of the 10 bank companies covered fell 4 percent—from $208.59 million to $201.23 million. William Bohn, President and CEO of Associated Financial Group, LLC (Kimberly, Wis.) has been elected to the board of directors of the American Bankers Insurance Association (ABIA). Associated Financial is the insurance unit of Associated Banc-Corp. Associated was the nation’rsquo;s 19th largest bank insurance operation, according to the 2008 Edition of Who’ Who in Bank Insurance. American Savings Bank (Honolulu, HI) sold its Bishop Insurance Agency unit to Monarch Insurance Services Inc. The thrift said it wanted to focus on its banking products and services. The bank bought Bishop Insurance in 2001. The agency, nearly 150 years old, sells personal lines and business insurance. It is the oldest of the 10 top insurance agencies in Hawaii. American Savings said it was entering a strategic alliance with Monarch to make sure its customers continue to receive insurance services and products. 154 E. Boston Post Road.